Delhi government has allowed to use Metro Smart Card in all DTC and feeder buses but in reality, none of the buses have proper machine services. New Delhi: The Delhi Metro Rail Corporation (DMRC) has launched new to the passengers to use its ‘Metro Smart Card’ in the public transport owned by the Delhi Government to make the travel smooth and easier for the passengers. However, Delhi Metro has excluded this facility for the last mile connecting ‘Metro feeder’ buses. The recent report was found that out of 174 buses not even a single feeder bus has the facility to purchase tickets using the metro smart card. Surprisingly, the ‘Common Mobility card’ is still a distant dream for the metro feeder buses as these buses are yet to be equipped with the ‘Electronic Ticketing Machines’. There are currently total 174 fleets affiliated with Delhi Metro and these ply on around 42 routes. Metro has allotted four depots at Yamuna Banks, Chattarpur, Paschim Vihar West and Azadpur. None of the buses were equipped with digital ticketing system. The conductors issued only manual tickets. No such ticketing facility is issued to us,” said a travaller. The bus numbered with route number 307 that runs from Laxmi Nagar to Kalyanpuri. In an another journey at West Delhi from Naraina Ring Road to Inderpuri and from Inderpuri to Todapur and Rajendra Place metro, most of the buses run on these routes do not issue tickets. According to Delhi Metro, traveling up-to to 4Kms is for Rs 5.00, and from 4kms to 10 Kms it is Rs 10.00 and further above10Kms costs Rs 15.00. 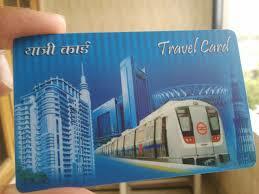 Delhi Metro Rail Corporation (DMRC) has provided hand held machines to the operators. Presently, some technical issues are being faced in a few of the hand held ticketing machines which are under rectification, said DMRC.